Y’all I love me a good bib. I didn’t really care for them with my son because A) he never really drooled and B) he is the cleanest eater I have ever met. But enter baby number 2. This girl NEEDS bibs. She drools, she makes messes, she chews on her clothes. The best part about bibs now, versus when we were kids, is there are so many options- there really is a bib for every need. 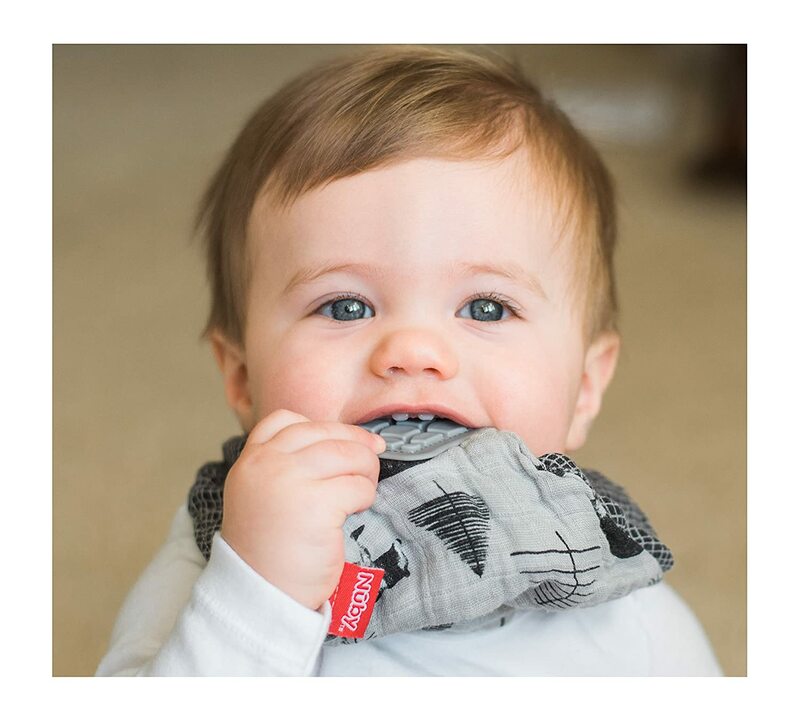 So let’s dive in: The Best Teething Bibs! You will need something a little more heavy-duty. I love the bibs that include a plastic lining, but they can be kinda of stiff/uncomfortable. I suggest these: Green Sprouts Stay-Dry Bibs. They have a soft outer layer on both sides and a flexible plastic lining on the inside. So totally waterproof, totally comfortable and they come in rainbow colors so they will match any outfit you put your little one in. At $17 and change they seem expensive but you are getting 10 bibs so they are pretty much the only pack of bibs you will have to buy! Guys.. BIBS HAVE CHEW TOYS ATTACHED NOW!!!! I absolutely LOVE the ones from Nuby (and all Nuby products, see my review HERE!). They feature a bibdana profile with a soft silicone piece at the end that baby can flip up and nom on. There are plenty of colors available and $7 for 2 bibs that double as a teething toy is not awful in my book! However, you can also kick it up a notch with a bib that has an actual toy hanging from it. These bibs, also featuring a bibdana profile, offer an absorbent bib with a teething toy attached at the bottom. The toy can be removed with a snap and is a basic, soft silicone teether. They give you the best of both worlds, but come in pretty limited colors (although very cute patterns). Does your baby start trends in the play group? Then this bib (from Indi by Kishu Baby) is for you! It is the most adorable mash-up of bib/baby infinity scarf/bandanna I have ever seen. The colors are super on trend and of course it only comes in organic cotton, which is also on trend! These guys will run you a bit more at around $28 for a three pack, but fashion does not know budgets. We all know that one baby that is allergic to everything, has skin sensitivities, is irritated by many textures/materials, well this bib is made for that baby. First, it comes from the wonderful people at Burt’s Bees so you know it is great quality and all organic. On top of that, they removed all closure issues (metal sensitivities, scratching from velcro, etc.) by making it with lap shoulders like onesies, so they easily just slip over baby’s head. They come in pink, blue and gray so color selection could definitely be increased but A+ for innovation for this one! I have a REALLY hard time spending money. I live for deals and shop pretty exclusively at second hand or discount stores, so when a product can do more than one thing, I am all in. The Aden + Anais Burpy Bib offers a myriad of functionality! It is a kidney bean shaped cloth that can be draped around baby and snapped in the back for a bib or draped over the shoulder for a burp cloth. It is also 4 layers of soft muslin so it is great for baby to cuddle with as well! You really can’t go wrong! With all the fancy shmancy bib options out there you really can find anything you need! And with teething comes drool so load up on your favorites so you will be ready for first teeth, first foods and general disasters. Do you have a favorite bib? Drop a comment below with all your crazy bib hacks, questions, recommendations or reviews!